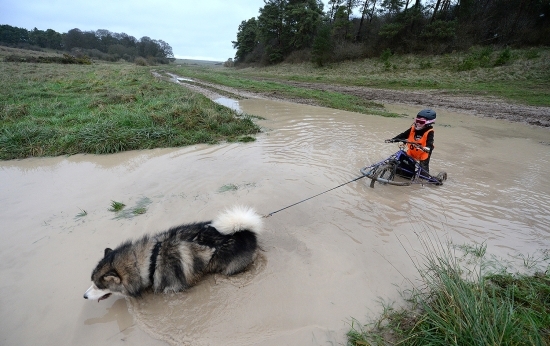 Salisbury Plain hosts Alaskan Malamutes on a Canine Exercise. Whilst the Military took a well-earned break over the festive period, the Salisbury Plain Training Area hosted an exercise of the canine variety. 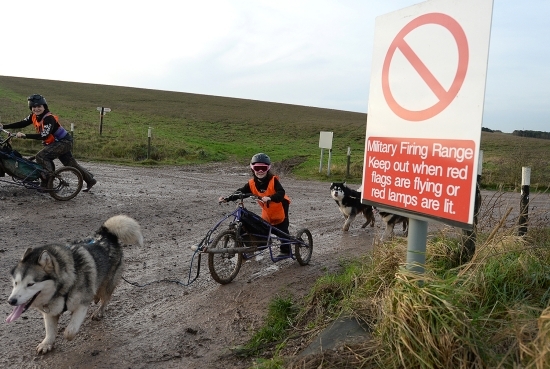 The Alaskan Malamute Working Association (AMWA) returned to the military training area on the Sunday 27th & Monday 28th December 2015 for its annual Working Dog Event, the Salisbury Plain Trek. The event organiser, John Binding said, �Salisbury Plain is an ideal venue with its wide range of terrain and conditions. It is the perfect place to learn about the dogs� abilities and to work together as a team. The weather once more was ideal for our canine competitors�. �The purpose of the Trek which is not timed is to allow competitors who go out in groups, the opportunity to work their dogs in harness over longer distances which is really what they are bred to do. There were a choice of four distances � 7.5, 13, 16.5 or 25 miles. There was also a night run which was set to be a minimum of 10 miles. Potentially teams could cover a minimum of 60 miles over the two days�. �There were different team sizes ranging from one to eight dogs. 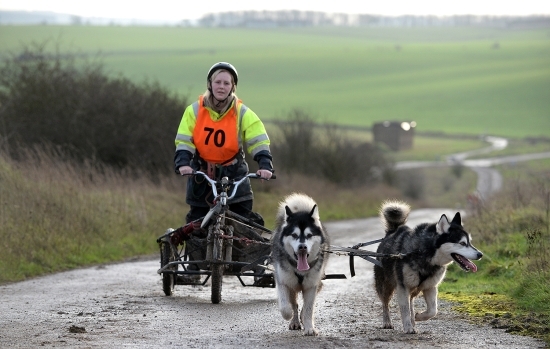 We use a three-wheeled cart called a Rig which the team of harnessed dogs is connected to using a gang line and pull from the front. The only control you have over them is by voice commands. 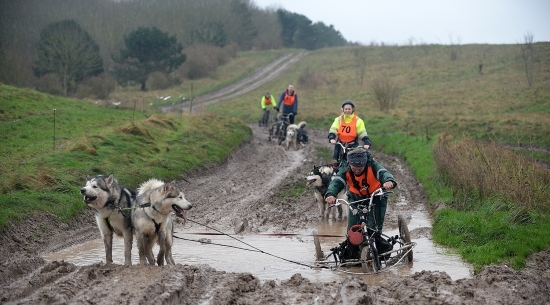 Purpose built scooters and mountain bikes can also be used for one-dog teams, which they pull from the front�. �The dogs do genuinely enjoy working in harness. They tend to get very excited and at times noisy and just want to go. It�s the stopping that can be fun. It is however, about knowing your dogs and their capabilities. You work as a team, competitor and dog alike�. The undoubted star of the show was Wiltshire schoolgirl Isabelle Thompson who became the youngest �musher� in the country to complete a sled-dog trek in the UK. 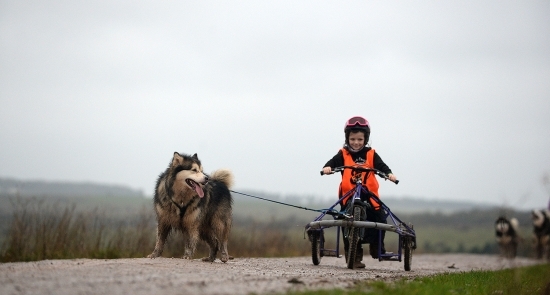 Isabelle (aged 8), a pupil at St Michaels Primary School in Figheldean, competed alongside the family�s Alaskan Malamute, Dushka (aged 5). Also competing and watching over her daughter, was her Mother, Kelly Thompson (aged 36). She competed with two other of the family dog�s, Tinker (aged 3) and Titan (aged 4), both Alaskan Malamutes. The Mother and Daughter combination and their canine team-mates, completed the 7.5 mile cross country course on both days. Isabelle said, �The best parts were going down the hills and the big puddles we went through, apart from getting water in my wellies. Dushka pulled well all the way around the course�. Her Mother, Kelly stated, �It was really good fun and great to go around the route with my Daughter. I�m very proud of her achievement�. 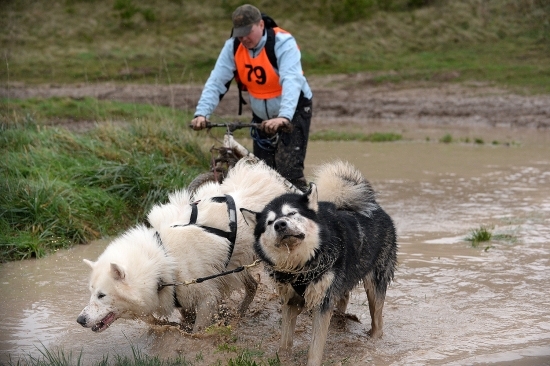 The event attracted over 30 entries over the two days with up to 100 sled dogs, with some competitors travelling from as far as Ireland, Birmingham and Essex to compete. The aim of the Trek is for the teams� to earn their Working Dog Trek certificates, by completing those set confirmed mileages at an AMWA organised event. AMWA Working Dog weekend events are held at number of venues throughout the UK between November and March. They are open to recognised purebred sled dog breeds such as the Alaskan Malamute, Siberian Husky, Canadian Eskimo and Greenland dogs.